Guest post by Dale Knoop, CEO of RAZ Mobile, a Kansas City-based startup that helps non-profit causes, campaigns, and candidates better engage a new generation of supporters via the power of mobile and social media. At any time of the year, this simple four-letter verb carries a lot of weight. At year’s end, it becomes a mission-critical request for nonprofit organizations that combine it with “please” to create an opportunity for holiday generosity and last-minute charitable deductions. Americans do a lot of giving. It’s 2 percent of GDP. Giving by individuals is the third largest industry in the nation, behind Uncle Sam and banking. And amazingly, today 75 percent of that individual giving is transmitted using the U.S. Postal Service. Unfortunately, postal rates continue to rise and subsidies for nonprofit use of the USPS will likely be amended or could be eliminated entirely. Realizing the diminishing returns for “snail mail,” non-profits are being challenged to find alternatives to direct mail for soliciting and collecting donations. “Give” is finding more and more power on the Internet, and fundraisers and donors alike are thrilled with what they see. But as we look back at 2012, there’s something missing to the “give” Internet presence: mobile giving via smartphones. Sometime soon, when no one is looking, the number of smartphone Internet sessions will surpass the PC and never look back. Giving a look ahead to 2013, you can see what’s driving this trend. More than half of all Americans have smartphones, and those numbers are growing exponentially. People of all ages (and especially millennials) live on their smartphones, and if your “give” isn’t there, then it’s got no power. Mobile giving is capable of so much more than simply the cell phone carrier’s text-to-give product. Today’s web-based technology for mobile giving offers massive scale and provides nonprofits with vastly superior means for anywhere, anytime donor engagement and brand building. At the same time, today’s platforms provide immediate access to funds instead of waiting on the carrier for 90 days or longer with text-to-give. Lastly and perhaps most importantly, today’s web-based mobile-giving platforms offer nonprofits the opportunity to dramatically lower fundraising costs while also raising the lifetime value of the donor by making easy to give when the impulse strikes. “Give” wants and needs a new home on smartphones. 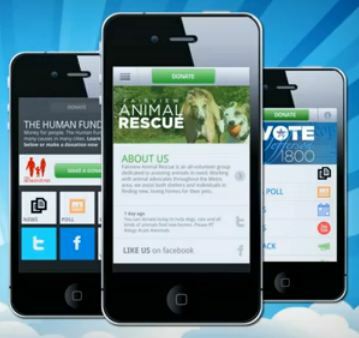 Will 2013 be the year you go mobile and put your “give” where your donors live?